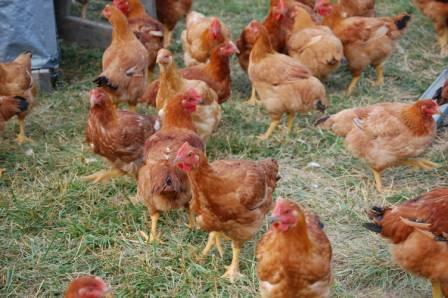 Freedom Ranger chickens are a slower growing, more traditional breed of chicken that performs great on pasture. The broilers are excellent foragers and their diverse diet lends them a deep, succulent flavor. These chickens have smaller breasts and a more dark-meat, traditional flavor. For more information on the breed, visit www.freedomrangerhatchery.com. Chickens are processed on-farm several times each year. Chickens are whole, with skin on and neck attached. They weigh between 3 and 5.5 pounds, on average. Our pastured pork is sold by the half and the whole. Whole hogs will yield about 175-200 pounds of meat and halves yield about 75-100 pounds of meat. Before your hog is processed, you get to decide how you would like your hog prepared. Pick-up dates will be determined by the rate of growth of the hogs and we will know for sure by early fall just when the juicy pork will be ready for your table. We sell you the hog before it’s processed but we won’t know your final order total until your pick-up date. Most customers enjoy the great-tasting meat for about $5.25- $6.25 per pound packaged weight. Our slow growing pasture-raised heritage breed turkeys have such incredible flavor you won't believe you're eating turkey! No dry, bland meat here! A diet of wild forage, pasture and non-GMO grain lends a deep, rich taste to the meat. Our turkeys weigh between 8 and 15 pounds and are processed on-farm the week of Thanksgiving. Please see our pastured poultry order letter to order heritage breed turkeys. Our pastured eggs come from both free-ranging hens and hens protected by electrified poultry net. Some eggs are brown, some are white, and a few are greenish blue! All have a beautiful orange yolk and great flavor. These eggs will add great depth to your baked goods and are wonderful in omelettes, fried or scrambled! Please see below to order pork by the cut. We love for our customers to see where and how their food is grown. All products are available for on-farm pick-up. Our 2017 farm pick-up hours are Mondays from 10am-7pm and others by appointment. Please call before visiting at 540.947.0337. We're happy to announce we're continuing to offer heritage breed meat chickens for 2018! We'll be raising New Hampshire Red chickens that we hatch on farm ourselves. This is the first year in our on-farm hatching endeavor and we are excited to make our heritage breed meat chickens a TRULY sustainable system by breeding, hatching, wing and processing these birds on-farm. The foraging instinct in these birds is amazing and they supplement their non-GMO feed with a little bit of everything. We've seen them eat all kinds of insects and grubs, seeds, pasture clovers, and pretty much anything else they could find. The meat on heritage breed chickens is rich and has a wonderful depth. It's like nothing you've ever tried before. The heritage chickens are processed on-farm several times each year. Chickens are whole, with skin on and neck attached. They weigh between 3 and 4.5 pounds, on average. Below are descriptions of the products that we offer. Click on the link in this box to order pastured poultry using our 2018 pastured poultry order form. There is more information at the bottom of this page on where to find our products.